Yeah. It’s going to be that kind of post. 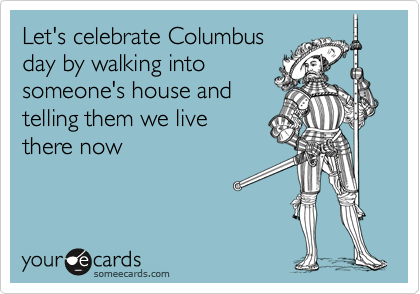 Today is the Columbus day, which is a day we celebrate Christopher Columbus for “discovering” the “New World.” This holiday has been heavily criticized, especially by Native Americans in the U.S.A. It is seen as celebrating the “discovery” of a land that was already known and inhabited by people. It is seen as commemorating an event that led to colonization and all of the evils and injustices that went with it. There are many efforts and articles around today that suggest we need to think and reflect on colonialism, indigenous rights, indigenous cultures, and a variety of things other than Christopher Columbus. Some have talked about replacing Columbus day with a National Indigenous Day or a National Day of Mourning over the evils of colonialism. I support these efforts and similar ones. However, there is one group of people that I think still needs to focus and study Christopher Columbus: contemporary Christians, especially those in the U.S.A and Canada. I say this because the life, faith and exploits of Columbus, when rightly understood, should serve as a cautionary tale to most Christians and be a prompt for some serious personal and communal introspection. I say this because the faith, theology and beliefs that drove Columbus to commit heinous acts, fully believing he was serving God and his country, are still alive and well today in the U.S. and Canada. This observant Christian was completely fine with participating in these evils. To make it worse, Columbus did not participate in these evils despite his sincere faith, Columbus’ faith was part of the reason he was so rapacious in his desire to exploit the New World. Columbus was not simply an imperfect and sinful but otherwise sincere Christian; Columbus was a sincere Christian, fully shaped by the faith and cultures of his day, and that is why he committed heinous evils believing himself to be righteous. Due to the colonization that followed Columbus’ “discovery” of America the Native American population which had been estimated to number around 8-12 million pre-contact was decimated to around 250,000 individuals at its lowest point in 1900. So what problems did Columbus have that are alive and well today that I think Christians need to think about more? Columbus was sincere in his faith. He was also involved in heinous evils. He also (I would argue) did not believe his actions were justified. I say this because I believe Columbus did not believe his actions needed justification; he truly believed he was doing God’s will and God was showing favor to him for it. This same faith is practiced today around the world. The masses, vespers, petitions ad pilgrimages would be recognizable to many Christians the world over. Sadly, Columbus belief that his actions were inherently good and in no need of justification and representative of the will of God is also widespread. Many Christians today, in my experience, have the same basic mentality, which is why I wrote my previous post. Many Christians believe they or others are categorically above injustices or evil because, “their hearts are in the right place” or God is on their side, or they are involved in the right kind of Christian sect. They misconstrue the benefits of the injustices and evils they are participating in with the blessing of God and therefore continue to perpetually justify their actions. Christian history is riddled with examples of gross injustices going hand in hand with sincere Christian faith and Columbus’ example should force us to grapple with the ways in which we may be participating in evil and calling it God’s will. Christians have an odd obsession and fascination with Israel. I believe this originates from the fact that the Judeo-Christian God being quintessentially the God of Israel, the majority of the Bible is concerned with Israel, and there are prophecies that refer and apply to Israel, yet Christianity has understood itself as a religion completely distinct from Judaism. A robust theological definition and understanding of Israel is lacking in Christianity as we have understood ourselves to be a new religion that the God of Israel initiated in Jesus after he apparently gave up on Israel. Yet the scriptures are still deeply rooted in Israel. This has led to a situation where Christians believe Israel is really important to God, but don’t know exactly what Israel is or why it is important to God. This has left Christian beliefs about Israel, Jerusalem and the Holy Land open to speculation, bad theology and widely but dimly held beliefs on the subject. This has led to all kinds of errors in practice and belief whose impracticality, implausibility, and lack of substantiation do not undermine how seriously people take them and how central they believe they are to faith. This was true for Columbus, who was preoccupied with retaking the Holy Land, and it is just as true, if not more, so today. In the U.S. especially there is an obsession or preoccupation with the fate of the nation state of Israel that was recognized/created after WWII. In this U.S. this is mostly due to the dispensationalist stream within Christianity and Christian Fundamentalism, about which I have written elsewhere. Notice that the assumption that the present-day nation-state of Israel is equated to the Israel of the Bible. Notice that the verses or teachings that are “clear” from the Bible are not explained or explored. Notice the political blame shifting. The entire economic and global situation in the U.S. is assumed to be punishment from the Judeo-Christian God because the U.S. elected a stealth Muslim President that does not back Israel. It has nothing to do with capitalism, or bank executives, or our government, or the politicians we have put in power, or the decisions we make regarding finances, or our reliance on the military-industrial complex, it is all the presidents fault for not supporting Israel. This implication abdicates everyone and everything, so we do not need to stop and consider our ways, admit wrong doing, or change anything. Columbus beliefs about Israel motivated some injustices. Our present day beliefs about Israel encourage many Christians to adopt an uncritical pro-Israel stance where the modern-nation state of Israel and all efforts to support it are, by default, above moral questioning. At the same time I highly doubt this person, or the vast majority of U.S. Christians who are innately pro-Israel, could articulate exactly why they are pro-Israel but don’t really know why. Here we see a clear example of a right-leaning news source highlighting the GOP/Romney with Israel/Netanyahu in an effort to increase their pairing for political gain. 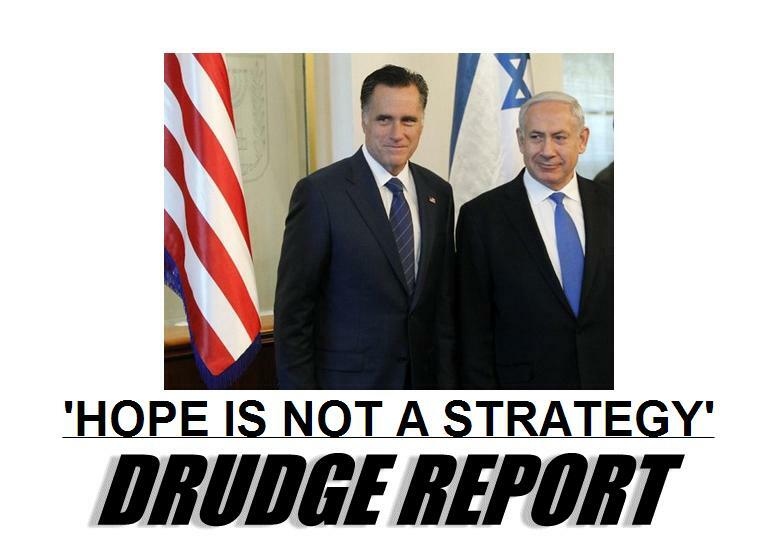 The message is clear: Romney is pro-Israel (whereas Obama is against Israel). This taps into any conspiracy theories about Obama’s faith and the dim theology that exists in the imagination of many Christians regarding Israel. It is enough to get many Christians in the U.S.A. to vote for the GOP candidate and it is a reliable strategy used rather routinely. Much the same continues today. The continued colonial practices of the U.S., Canada, Israel and other nations are accepted or even supported by well meaning and sincere Christians. In North America especially Christian in both Canada and the U.S. have turned a blind eye or directly supported the continued genocide and colonization of Native Americans and First Nations. While these efforts have been unjust, evil and incredibly harmful to Native American and First Nations communities, they are ignored, supported or never even discussed. To be abundantly clear, I am not anti-Israel anymore than I am anti-Palestinian or anti-South African, or anti-Chinese. I am pro-justice. I am not for the death of innocent Israelis or the death of innocent Palestinians. I decry anti-semitism, specifically pointing out how Christians have nonsensically been involved in that. I believe the Holocaust happened and it was incredibly evil. However, I do not think these historic injustices against Jewish people give them carte blanche to do whatever they want with moral impunity. Right now many of Israel’s practices are those of a colonial occupier backed by military force. These injustices only aggravate ethnic and religious tensions. I do not think this is just and all nations need to be held accountable for their injustice. The international rationale behind creating, recognizing and supporting the nation-state of Israel appears to be that the Jewish people suffered injustices, most notably a genocide that raged under Hitler in Germany for several years. This apparently qualified them to receive the sacred land they held to be historic even though this displaced the people who were already living there. Native American and First Nations people have suffered various forms of cultural and physical genocide for over five hundred years. Many of these efforts at genocide and colonialism are still ongoing as the U.S. and Canadian governments continue to disrespect tribal sovereignty, leave previous treaties broken, and use Native American land and people as test grounds and test subjects for medical and military tests. This real history is as well documented or more well documented than the Holocaust (which again to be abundantly clear I do believe happened and was real and was evil). Applying the same logic to in North America as we do in the Middle East, should we not then give Native Americans and First Nations their land back, at least the ones they were promised in the treaties or the ground they consider sacred? Should these nations be internationally recognized as autonomous from the U.S.? Should not this be done regardless of who it would displace? Should the U.N. intervene in the U.S. and Canada as it did in the Middle East? Native Americans have suffered and are suffering cultural and physical genocide. They have suffered displacement, broken treaties, mass-murders, religious intolerance, biological warfare, environmental racism, cultural destruction, and have seen their land and their citizens as lab-rats for medical and military tests. Considering the differences in their population pre and post contact, I do not think it is unfair to call this a genocide. Several million people were killed in the course of claiming this land as our own. Therefore, I would say yes to all of my rhetorical questions above. I am all for honoring the treaties, giving the land back, and not just offering empty apologies and lump sums of money. Conclusion: Columbus Day should be a day for Christians to reckon with our colonial past so that we are forced to grapple with our colonial present, both here in the U.S. and Canada, and abroad. This entry was posted in Faith, Personal Commentary, Politics, Postcolonial and tagged Christian Fundamentalism, Christian Right, colonialism, Columbus Day, Imperialism, Israel, nation-state of Israel, Romney 2012. Bookmark the permalink.